Amount Per Serving: Total Calories: 5 Protein: 0g Total Carbohydrates: 1g -Sugars: 0g -Dietary Fibre: 0g Fat: 0g -Saturates: 0g Sodium: 40mg Vitamin C (as Ascorbic Acid): 250mg Vitamin B6 (as Pyridoxine HCL): 25mg Calcium (as Calcium Silicate): 48mg Phosphorus (as Potassium and Sodium Phosphate): 58mg Magnesium (as Oxide): 200mg Sodium (as Sodium Phosphate): 40mg Potassium (as Potassium Phosphate): 100mg Instantized BCAA's Patented Pending 3:1:2 Blend: (3,000mg) L-Leucine (Instantized): 1,500mg L-Isoleucine (Instantized): 500mg L-Valine (Instantized): 1,000mg Cellular Energy & ATP Fueler: (4,775mg) L-Glycine, L-Alanine, Citrulline DL-Malate 2:1, L-Carnitine L-Tartrate, Coenzyme Q-10. Amino Hydrate System: (2,323mg) L-Taurine, Coconut (Cocus Nucifera) Water Powder, Beet Root Extract (Beta Vulgaris) Containing Betaine (High Nitrates), Goldenseal Root Powder (Hydrastis Canadensis), Sarsaparilla Root Powder (Hemidesmus Indicus), Slippery Elm Bark Powder (Ulus Pumila). Other Ingredients: Malic Acid, Natural & Artificial Flavours, Red Beet Juice Powder (for Colour), Potassium Phosphate, Sodium Phosphate, Sucralose, Acesulfame Potassium. Please Note: Nutritional facts and ingredients may vary slightly between flavours. Revolutionary sports performance muscle recovery & hydration drink! Specially formulated for all athletes, quick-absorbing Amino 1 supports stamina, hydration, muscle building and in-workout recovery in "1" comprehensive formula. Amino 1 supplies free form amino acids, instantised BCAAs, and a complete electrolyte balance. Superior Ingredients, Superior Results: Quick absorbing Amino 1 was designed for athletes and contains over 10,000mg of amino acidsâ€”patent pending 3:1:2 ratio instantised BCAAsâ€”for sustained stamina and muscle building. Amino 1 may help athletes work through the soreness: Amino 1 delivers nutrients through multiple pathways, which may ultimately support recovery. No other sports drink supplies more power in the needed time interval, making this the ultimate in-workout recovery drink. 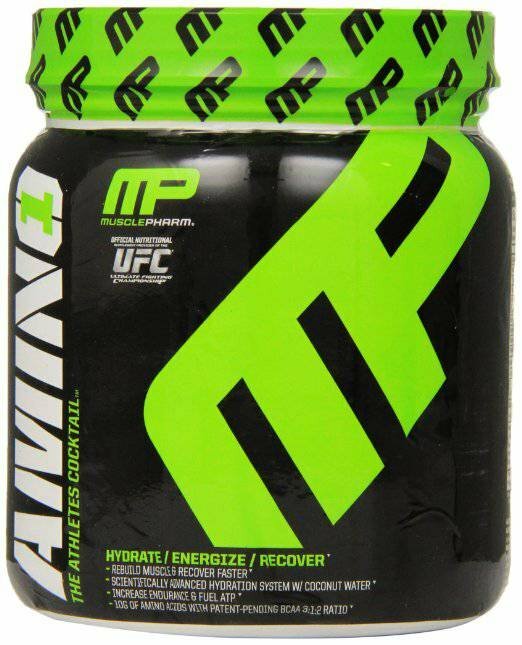 Advanced hydration & electrolyte system: Muscle Pharm believe that all-natural coconut water concentrate is one of nature's superfoods, a complete balance of electrolytes and mineralsâ€”and so could maximize uptake. It may also be superior to manufactured sports drinks and this may be why the sports world in America has turned to coconut water concentrate as a rehydration source.